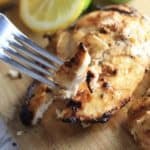 An easy, zesty grilled chicken recipe with a quick marinade and loads of flavor. Perfect for Summer! Combine marinade ingredients into bowl. Stir well. Score chicken breasts horizontally and vertically to create a cross pattern. Grill on medium heat for about 20 minutes or until chicken reaches an internal temperature of 165 degrees farenheit.